I try to bake every month. I love trying new recipes. I get bored baking the same thing over and over again - with the exception of chocolate chip muffins (because I love chocolate & it is easy to make). I ordered fruit puff in Winter Warmers last month and I it looked easy to bake and I get to save RM9.90. So I baked fruit puff for my family for breakfast last week. In case you are wondering, no, I did not make the puff pastry from scratch. I used store-bought puff pastry to save time. 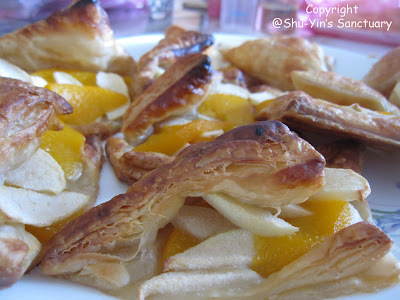 For ingredients, I used sliced apples, pears and canned sliced peaches. It was delicious while it is hot. And just yesterday, I baked again. 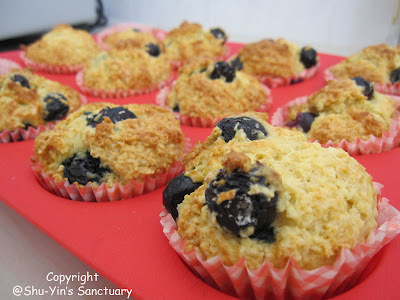 I baked banana muffins AND blueberry muffins. Since, I had featured banana muffins in my blog last year, I am not going to include any photos here. I saw some blueberries from Chille selling in Cold Storage for RM9.90 for 120g, so I grabbed a box. I found the blueberries not flavourful enough and also my recipe did not call for any butter and thus my blueberry muffins were not ooomphh enough for me. Edible, yes. But not that nice compared to other muffins I made. Ah yee loves it though, saying that it is not too sweet.